Which Event Is Best For Me? Please note: we do not send tickets by post, instead they will arrive attached to your booking confirmation email. In April 2018 we opened our new, state of the art Gillian Dickinson Astro-imaging Academy, to further our aims of inspiring and educating as wide an audience as possible about the Universe. These new ‘Physics in the Forest’ events are designed for the guest that wants to learn that little bit more. We will delve deep into a current topic in Astronomy and discuss the science behind the headlines, while keeping things digestible and understandable. We will take a look at our powerful new telescopes designed for deep sky imaging and astronomical data gathering, and weather permitting there’ll be a chance to gaze through eyepieces at some of the majestic sights of the Cosmos. Humanity’s outlook on the Universe has changed a lot across the generations. The Ancients looked out at the stars and, unable to see distance, concluded the Earth was at the centre of everything. In 1610, Galileo began the process of using observation and evidence to mould our ideas about the Universe, kick-starting Astronomy and all of modern Science. Since then, our knowledge about the scale of the Universe has changed drastically, with some of the largest leaps taking place in the last century. 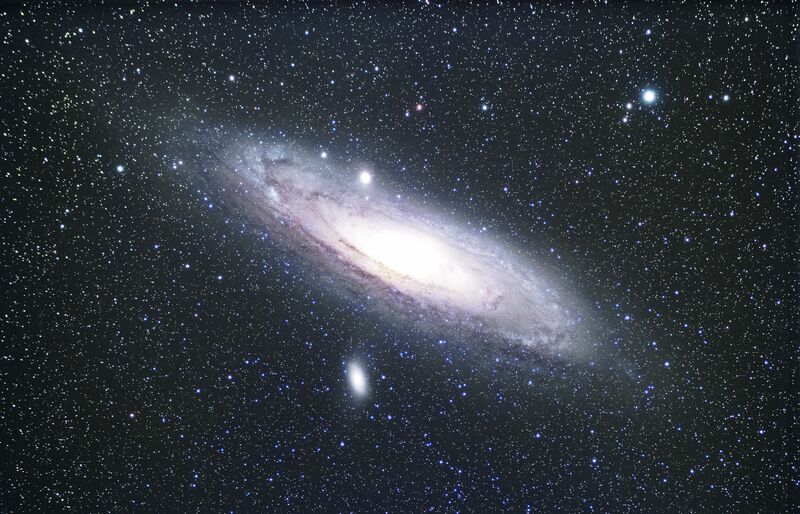 We have learned that our Sun is just one of hundreds of billions of stars in the Milky Way, which itself is just one of trillions of galaxies that are out there. Tonight we will look at some of these recent major discoveries and how they changed our outlook on the Universe. We will start in the 1920’s, when the discovery of the Universe’s expansion first led to the notion of the Big Bang. Later we will look at more recent developments indicating that the rate of expansion is accelerating, an effect called Dark Energy, and what that means for the eventual fate of the Universe.